Usability is not a trend, it is a necessity. If you are not already ensuring that your digital content is easy to navigate you should start now. It doesn’t have to be hard. There are plenty of UX strategies that make the process of creating user-focused experiences easy. It’s all about knowing what they are and deciding to use them. That is why instead of the gym membership that you won’t use, we suggest making a 2018 resolution that will actually generate results. How about committing to create more user-friendly experiences? We will even provide some tips to get you started. Here are eight UX strategies (disguised as resolutions) that can help you reach your high usability goals. Stop Thinking Like a Designer. Trust us, we get it. It can be fun to create beautiful experiences, especially when you know how. However, in the end, the aesthetics do not always translate to usefulness. Plus, many users go online to solve a problem in addition to being entertained. If you want to truly win over your users, and create content that they will appreciate, you’ll need to put the design brain on the back burner just for a little bit. The most important of all UX strategies is planning, not designing. You need to do the research to figure out who you are creating for and what their needs are. This is when you ask questions about the competition, conduct focus groups, and get really familiar with the marketing team. You will need to think like an architect – an architect of information. Don’t worry, you’ll still have a chance to get creative, but not at first. How many designers does it take to create a website? Many times, you only need one. However, when you make the resolution to focus on usability, the one-man artist concept goes out the door. A key idea behind all UX strategies is the acknowledgment that content is created for others. Therefore, you are going to need to collaborate with others to ensure the users’ needs are met. Creative collaboration can be difficult, especially when a single person is responsible for providing all of the ideas. However, many UX strategies take this into consideration. Instead of immediately creating your end product, build in steps. 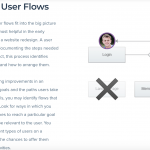 Create wireframes, prototypes, and user flow maps. Share your progress with everyone involved with the end product. Ask for their contribution. If this task seems daunting (agh, those emails!) it doesn’t have to be. Slickplan makes the website planning portion easy for you, while also making it easy to share with team members. 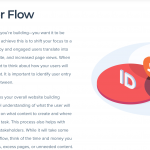 With online hosting of your sitemaps, user flows, and wireframes – you don’t even have to talk to the other people involved, if you don’t want to. When you work as a creator, it’s easy to get caught up in the creation and not the process. From the moment you envision your final product, your brain is eager to bring it to life. However, for 2018 you should make the resolution to let go of the reigns just a little bit if you want to start creating user-focused designs. Creating optimal UX products and content is about figuring out what the user wants and balancing that with what the business needs. That means you may have to scrap your original design and start over – if that balance isn’t met. Deep breath, my friend, it will be okay. Some UX strategies that help you through this include A/B testing, open communication with customer service, and continual testing of your product or site. If it’s broken, fix it. It’s all part of the process. Learn UX Strategies from the Experts. Reduce the number of clicks a user must make. Clicks require effort. You probably want that effort going elsewhere, like down a sales funnel to the Buy Now button. Use imagery instead of words. Once again, this one is about effort. If a picture is worth a 1000 words, think about how much more you could say with less effort from the user. Keep it simple. This means everything. Keep the navigation simple. Keep the content simple. Some even suggest keeping the design simple. How far you go with this one depends on the needs of your user. Teach when needed. Do not assume that your users know everything. Take the time to properly explain the process to them. It’s called onboarding, and it makes every new experience go considerably smoother. Understand That No One Is Safe. Having a strong brand will not necessarily save you from having a poor user experience. It could potentially cushion the blow of disgruntled users, but it still matters. Plus, if consistently ignored, you run the risk of losing users due to having an unfriendly user experience, which trickles down into that powerful brand that marketing has been working so hard to build. In other words, don’t mess it up with poor UX. Here is an example, as critiqued on Ascedia.com. 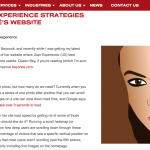 Ascedia is a digital design company that recently broke down the many design flaws on the brand icon, Beyoncé’s, website. Poor load times. All of the pictures make the site load slow. People don’t like waiting for websites to load. Not even for pictures of Beyoncé. A scroll map could show her designers where users are giving up and help identify how many pictures of Beyoncé her fans are willing to wait for. Lacking search options. Good luck finding what you are looking for on this site. A focus on ‘search within the site’ could help site visitors locate what they are trying to find. Hidden navigation. Sure, design-wise, a navigation menu would be distracting from the pictures of Beyoncé, but it would also help users find whatever information they are seeking. According to Ascedia, Beyoncé’s website is not user-friendly. In fact, it is borderline frustrating. No one is safe. Not even a brand diva. Of course, the entire concept of design is that you can create something that is better and new. However, some things are better left as is. There are UI standards for a reason – so users do not get confused. Familiarity breeds comfort, so learn the rules and incorporate them into your designs whenever you can. By standards, we are talking about navigation and element design, but as you are creating, you may come across other design elements that already work well with your users. If it’s not broken, don’t fix it. Just keep coding. Obeying the UI standards is one, of many, respected UX strategies because it keeps users from having to learn new ways of thinking. Less effort is a good thing, so whenever possible, try to keep from going too out of the box if your users aren’t ready. You can figure out if your users are ready by asking them, conducting A/B tests, and removing any UI features that cause user confusion. Yes, we suggested following the rules, but that does not mean you should copy every successful website you can find. Those websites are likely a success because they understood their users and created an experience designed for them. Unless you are the exact same company, with the exact same product and users, you probably don’t want to create the exact same site. This is when you, once again, stop thinking like a designer and put on your team player hat. Find out the competitive advantage of the business you are designing for, and work that into your design. Get to know your users and truly understand how they differ from those of the site you’re crushing over. Maybe even do a deep dive and find their flaws. Beyoncé has shown that any brand is capable of critical UX flaws – why not strive to be better? Nearly anyone can create an amazing product or website with high usability – because it is based on the unique needs of the user, not necessarily the skills of the designer. Although UX strategies can dramatically improve the success of any website, don’t expect to see results overnight. The effects can take time, and the process can take longer than anyone often expects. As we said before, UX design is a process. Designers must be willing to monitor the results of their work to see how well it resonates with the user and make changes when necessary. Eventually, when this process is repeated long enough, you will reach that sweet spot where the majority of users are happy. Your project will reach that point, eventually. You just have to be patient and continue doing the work. May your 2018 be filled with plenty of non-frustrated website traffic!